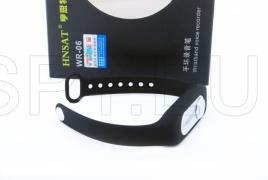 In a bracelet which is an imitation of cardio monitoring device there is a mounted audio recorder. 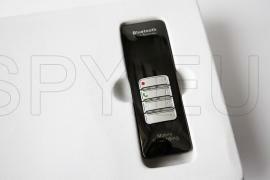 Management of the device is extremely simple - just one button to start and stop the recording. 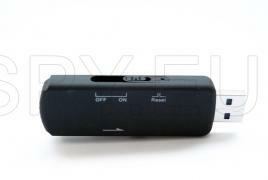 The built-in rechargeable battery provides over 15 hours of continuous recording. The file format in which the bracelet records is WAV 128 kbps. The built-in 8 GB of memory allows you to store over 140 hours of recording. 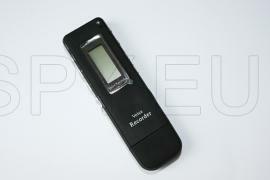 With this recorder you won't have to listen long files that actually contain nothing recorded. It is activated only when talking takes place near it (ambient noise exceeds 65 dB). This way you will only record the conversation and thus reducing the energy and memory consumption. The flash drive has a capacity of 4 GB and can store about 70 hours worth of recordings. The lithium-ion battery provides about 15 hours operation time. Managing recorder is very easy – by using a single button switch you can turn it on or off.